Guide to Olympic National Park. Opens in a new window. Friendly staff members and a clean comfy room. I am glad I read the previous reviews and picked this place to stay at. Will book here again. Staff was nice, walls were incredibly thin and we even hear very quite noises from neighbors. They provided ear plugs, so it seems to be a known issue. Where to find Port Angeles hotels near an airport? Where can I find hotels in Port Angeles that are near tourist attractions? 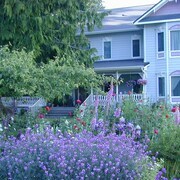 Travelers to Washington Coast who are looking for quality accommodation in Port Angeles have plenty of options. Expedia's accommodation network offers 10 apartments and hotels within easy driving distance from the town center. 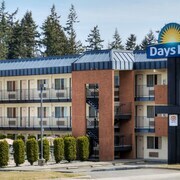 Within 1 kilometre (0.6 miles) of Port Angeles' downtown, travelers can enjoy a selection of Expedia-listed accommodation options, such as the Red Lion Hotel Port Angeles and Quality Inn Uptown. 20 kilometres (13 miles) away from the heart of Port Angeles, is the Lost Mountain Lodge. Alternatively, the Port Angeles Inn is 0.2 kilometres (0.1 miles) away. 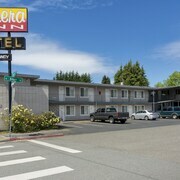 The Days Inn Port Angeles and the Super 8 Port Angeles WA are other alternative hotel options around Port Angeles. Keen on seeing more of the beaches and forests common to this area? Why don't you spend some time in some of the other places in Washington Coast? Enjoy hiking or make a trip to the region's visitor attractions. Comfortable hotel options are available. 75 kilometres (46 miles) away from Port Angeles is Forks, where you can visit Bogachiel State Park and Forks Timber Museum. 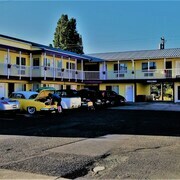 If you'd like to stay in Forks, check Expedia's booking pages for the latest deals at the Miller Tree Inn and The Dew Drop Inn Motel. 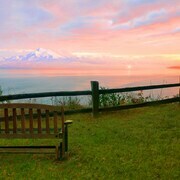 Or, you could stay in Sequim, 25 kilometres (15 miles) to the east of Port Angeles, where you can choose from the Holiday Inn Express Hotel & Suites NORTH SEQUIM and Quality Inn & Suites at Olympic National Park. The Sequim Bay State Park and Dungeness River Audubon Center are just a couple of the more popular sites to experience when you're in Sequim. Before you head home, consider spending a few hours rubbing shoulders and cheering along with local sports obsessives at a local match. Husky Stadium is 100 kilometres (61 miles) to the southeast of Port Angeles. Stay right near the action at the Four Seasons Hotel Seattle or the Seattle Marriott Waterfront. Our travel guide is also a very good way to discover more about Port Angeles. 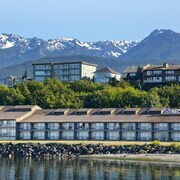 What are the most popular Port Angeles hotels? Fun, Relaxing, Family Friendly on Sunnypoint! 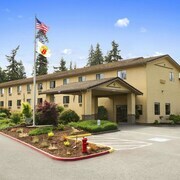 Are there hotels in other cities near Port Angeles? 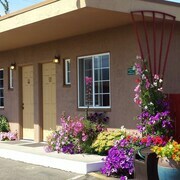 What other types of accommodations are available in Port Angeles? Explore Port Angeles with Expedia.ca’s Travel Guides to find the best flights, cars, holiday packages and more!